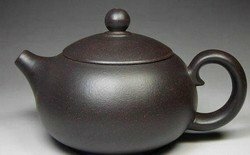 A red clay (Zhuni) Yixing Chinese tea pot handmade by highly regarded artist Zhu Xinnan. The pot holds 200 milliliters, it comes with 2 matching cups. This attractive design is named after the most beautiful woman who ever lived in China - Xishi. 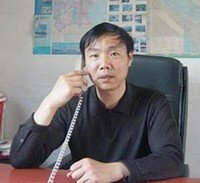 It is made by highly regarded artist Zhu Xinnan （朱新南）. It is one of his more popular designs. It is a high quality red clay (Zhuni) that has been left to weather for 25 years before being crafted. Because it has appears sapphire on the outside, it is known by the Yixing artists as the Sapphire Zhuni. Since this is a red clay, it is harder and has higher frequency, which you can detect by gently knocking the lid against the pot. Although it is best for brewing green tea or aromatic oolong, you can also use it to brew other types of tea. Just remember to use one type of tea for one pot. The pot holds 200 milliliters, so it is suitable for 2 persons. It comes with 2 matching Yixing cups. The surface has a natural luster. After short period of seasoning, it acquires a greater shine, which has a warm, darker hue. 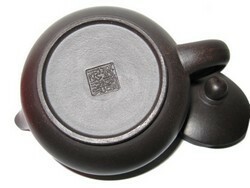 This Yixing Chinese Tea Pot has 14 holes behind the mouth. When you let the water go, it will stream out as far as 8 centimeters. 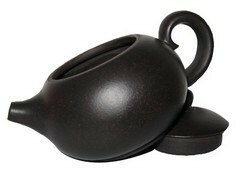 This tea pot will come with 2 matching cups made from Yixing purple clay.